Hosted by Dr Mathew Hillier, Monash University, Australia. Starting 07:00AM UTC/GMT. Duration 1 hour. 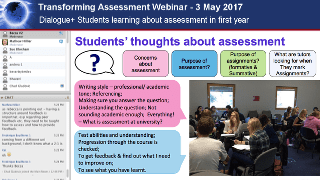 This is a joint webinar organised with the Assessment in Higher Education conference 2017 secretariat. This webinar outlined the Dialogue+ process and explored the experiences of students, lecturers and peer-mentors. Dialogue+ supports first year students’ participation with, and understanding of assessment and feedback processes at university through the promotion of dialogue with lecturers. The intervention uses an interactive coversheet (ICS) (Bloxham and Campbell, 2010) along with lecturer and peer mentor-assisted workshops and peer mentoring. To succeed at university, students are required to enter into new environments with unfamiliar ground rules whilst they negotiate relationships with tutors and understand the meaning of writing assignments and assessment processes. Often, learning about assessment and feedback processes is exacerbated by the tension that students cannot participate in the practice of academic writing to the standard required by undergraduate studies, (Lowe & Cook, 2003) and do not (fully) understand the rules and processes of this practice (Carless, 2006). Bloxham and Campbell (2010: 293) suggest that ICSs are a potential mechanism for encouraging students to take responsibility for their learning within this process as they allow students to ‘prompt dialogue on the issues of importance to them’. However, they reported that although the ICS did encourage students to think about their work. Many students found the questioning aspect of the process problematic as they did not have a clear enough understanding of the standards and requirements of the assessment, to engage in meaningful discussion. For the majority of the students feelings of embarrassment prevented them from asking their tutors for help. This may be due to perceived power imbalance between students and their tutors (Boud, 1995). Drawing on the work of the WriteNow CETL (O’Neil, 2008), peer mentoring was considered a less embarrassing or intimidating means by which dialogue could be promoted. Breaking down barriers to communication allowed students the opportunity to develop a meaningful understanding of the standards and requirements of the process. It is hoped that by illuminating the nature of the complex relationships between students and teachers we can generate new understandings useful for future discussions of academic writing and assessment processes. You Tube version (Flash video) – recommended version. A screen cast of the session. Note: You can choose to view in standard definition or high definition and in full screen mode. This uses the classroom system itself to re-play a recording of the event. You are also able to jump forward, back and pause the recording. View: Session recording in Blackboard Collaborate. Note: links shown inside this recording are only ‘clickable’ when displayed in the lower left ‘text chat’ area. Please refer to our help page on how to access the virtual classroom system – help page.